Sunday, there are a few records in the charts you want to hear, but everyone’s waiting for 7 o’clock. It’s the Annie Nightingale request show. I never wrote in, but always loved the humour and stories shared between the listeners and Annie. (Did the songless Rebeccas ever get a tune? Whither green ink? How do you spell “The Murks/Mercs/?”? Where are all the Durannies now?) 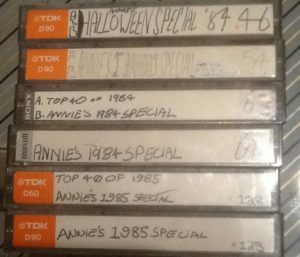 I’ve got loads of tapes of songs I recorded from the show, but when I saw Annie tweet that “most of the request shows were wiped. I have no copies.”, I thought “oh, complete shows? I’ve got one!”. On digging out my cassettes, it turned out I had four complete shows. Great! Now to dig out a walkman. Oh, it doesn’t work anymore. No problem, I’ve got a spare one. Oh, that doesn’t work either. So a couple of days later, it was off to Argos to splash out on a brand new £17 walkman. Cheap as bananas, but… it works. Now to plug everything into my Mac, and capture with Audacity. Seems like a couple of the shows were recorded at a touch too high level, so there’s a bit of blast at the top, but it’s listenable. What a trip down memory lane to listen to these! Turns out that I always think of the words “MOno SOdi-um GLU-ta-mate” in that particular cadence because of Toyah’s “Creepy Room”. I’d totally forgotten that track. Who remembered the “neckless men in blazers and cravats”? Or Mr Murray’s daftness? Wow. Well, Annie, thanks so much for all the great tunes, the memories, and I’m delighted to be able to respond to your official BBC request (well, that’s how I’m taking it) by giving you something back. So for The Kamikaze Pilots, Magazine, for Christina’s Is That All There Is?, for The Ramones, The Blue Nile, for Here And Now and It’s A Fine Day, for The Passions, for Fish Heads and This Mortal Coil, for Wood Beez, Split Enz, for Siouxsie, Janis and the Cocteaus, Germans, Prince Buster and The Icicle Works, and all the rest, Merry Xmas, Annie, you legend. Captured to AIFF, compressed to 256kbps .m4a AAC files. The solution to my December Cyptish Crossword can be viewed here. The grid was still a little blocky, so a few clues can be fully “solved” just by solving all the cross-clues. Something to try and improve in future grids. My next grid is filled, with a little light theming too. Not sure if it’ll be my next Cryptish though, as I may try to find a nice home for it elsewhere. Meanwhile, back at the December puzzle, there were a few clues I’d had saved up that fitted in here. One clue had a trap. I wonder if anyone fell into it. A reasonable range of clue-types, I think, and I don’t think I overused any one type this time. Possibly I even underused one type. Hey-ho, that’s variation for you. I liked 42A and 37D. A little light reaction on Twitter. I’ve been wondering… should I explain my clues? After all, if I do a crossword in a newspaper, you don’t have the setter available for consultation afterwards. Just the solution posted a week later, from which you have to work out why the answers fit the clues. And if I do explain, will that mean people get to know my setting style quicker? …Rather than puzzling it out slowly as they go along. (Much as I’m doing myself!) Then again, there are blogs out there which explain some puzzle solutions. I’m not sure. I’m leaning towards silence. Feel free to share the link or RT/Like/comment on Twitter, if you enjoy it. The solution to my November Cryptish crossword can be viewed here. I was reasonably happy with this one at first, but after I’d published it, I realised that I’d used one type of clue 6 times, which was probably too many. Also, 21D, 36D and 42D could all have been made a little better, I think. 41D and 44D were both fairly easy, but they raised a smile, I’m told. I originally had the clue for 1D as half as long, but decided that if you didn’t get the reference (which was already slightly veiled), there was no way of working it out (aside from guessing with the checked letters), so I added the second half. 25D was probably my favourite. Unfortunately it only got to 4 retweets, so I withdrew the prize offer. But on the plus side, I did get some interest on twitter. Thanks retweeters, and it was also good to hear from Helen, Anna & Richard that they were having a go. (I think you finished it, Richard?) I did receive a completed grid from Mikey (who’s not on Twitter) by email, but he had solved 7A as “Lan”. Actually, it’s a good solve of the clue (and one I hadn’t thought of), as it’s inside “garland”, and can be argued to be a circle. Unfortunately, that makes another clue end up incorrect. Mikey did work it out though. I’m working on my next one. The grid’s completed, but only a couple of clues are written so far. I might release it this week. Well, I might not be getting much feedback, but at least I’m still enjoying setting crosswords. I also started following a few more setters and crossword bloggers on twitter. Hmmm, there’s a hell of a lot of crossword talk out there. I’m not sure how interested I am in reading it though. I suppose I’ll get sucked in, and I’d better be ready to admit that I’ve still got a lot to learn. Meanwhile, here’s another one with a £5 bounty for charity. As I type, the prize is currently still available, so go get it, follow and retweet. Then solve it! Solution one week after the 5th RT happens. Right, that’s this blog up to date. Give me a shout on twitter if any of this is of any interest. I’d had a brief chat on Twitter with Everyman, who kindly gave me some feedback on my July puzzle. He said he particularly liked some of the clues, didn’t quite get a couple of references (but got the clues anyway). Also gave me a few words of wisdom, so thanks Colin! Right-click to save, then print. Answers are in an image in this tweet. I had some feedback on my June puzzle from a twitterer who I’d been talking to about possibly submitting a crossword for a magazine he was starting. – Symmetrical grids are preferred. – Indirect anagrams are a bit frowned on. He also told me he liked quite a few of the clues, and my style (which was different from his). That was nice, and encouraging. So with that in mind, I knocked up my July puzzle. No prize offered this time. This one felt more like a “proper” cryptic to me, with a tidier grid, and clues that conformed to The Rules better. I was on a roll, so only a week after the last one, I made a crossword with a county cricket theme. Niche? Sure, but why not. The grid’s a bit skew-whiff, but I was having fun fitting in as many references as I could. If you’re bowled over by it, do let me know. This one’s a pdf. Download, etc. Answers are in a pic in this tweet. Well, since I’d been breaking some rules, I thought maybe I can’t call my crosswords “cryptic”, so I’ll have a new name. This’ll do. However, I did decide to try to stick to The Rules (as I was learning them). “Avoid 2s” was another one. Here’s my next attempt. Smaller, 15×15 (which is a common size, apparently). I decided to try out offering a small prize for the first correct solution via Twitter. The answers are here, as supplied by the winner, @soozbury. You can send me feedback, if you like via my twitter account.